Sharon Rae Kuhlmeyer Joiner, 73, of Addison, entered into rest on Friday, April 12, 2019 at her residence surrounded by her loving family. Mrs. Joiner was born on Oct. 24, 1945 in Arkansas City, Kansas. 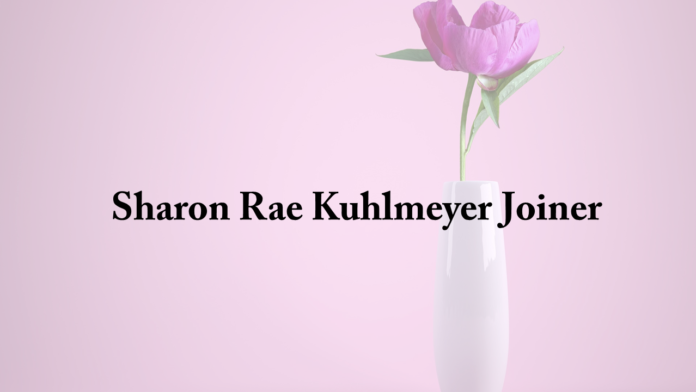 Sharon was a member of Central Christian Church in Arkansas City, Kansas for 19 years and after moving to Kentucky, she attended Floating Church. She was a 1963 graduate of Arkansas City Kansas High School and went to Cowley County Junior College. Sharon worked as a waitress at a bowling alley in Arkansas City, as a nurse’s aide at Halstead Kansas Hospital, and a co-owner at JB’s BBQ in Addison, Alabama. Above all she enjoyed spending time with her children and grandchildren. She loved her cat Miss Priss. Visitation will be on Monday, April 15, 2019 11 a.m. 1 p.m. at Nichols Funeral Home in Addison, where services will be held at 1 p.m. Brother Mike Tidwell will officiate. Burial will follow in Addison Church of God Cemetery. Sharon is survived by her sons, Chris Kuhlmeyer and his girlfriend Belinda Turner, John Kuhlmeyer and his wife Robyn; daughter, Pam Wilkins and her husband Tony; step brothers, Mike Dailey, Steve Dailey and his wife Suzannah, Terry Dailey; and sister, Debbie Wood and her husband Gary. She was “Grandma” to seven grandchildren, Derrick Garity, Ryan Garity, Danyle Kuhlmeyer, Jeremy (Britney) Wilkins, Holly (Jake) Lee, Justin Kuhlmeyer, and Logan Wilkins. She was preceded in death by her first husband, Paul Kuhlmeyer, second husband, Mike Joiner; father, Jack Raymond Dailey; mother, Dora Mae Dailey; step mother, Rose Dailey; and step brother, Jack W. Dailey. Next articleObituary: Coy Wallace Lauderdale, Jr.